Arrowhead Marsh developed in San Leandro Bay between 1855 and 1895. This is the story of how we think that this might have happened. Arrowhead Marsh is one of the few marshlands left in the East Bay. However, it is relatively young. The 1855 survey (in black) shows open water where the marsh now sits. Arrowhead Marsh was probably built up of earth washed down San Leandro Creek during construction of the Lake Chabot dam. Although another possible source is sediment from the logging of the San Antonio Forest -- probably both contributed. A survey taken in 1895 shows, in brown, new marsh filling the old creek channel and extending into San Leandro Bay, and, in blue, the new channel of San Leandro Creek. 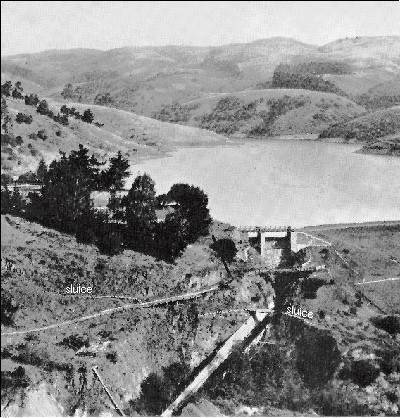 In 1874 work began on Lake Chabot. Soil excavated from the dam site was dumped into San Leandro Creek below the dam. Then, an unexpectedly severe storm breached the partially built earthen dam, and washed away 21,000 cubic yards of the dam's clay core along with much of the soil already dumped into the creek. Over the next twelve years, rock debris was added to the dam by sluice, a process that probably discharged additional silt. 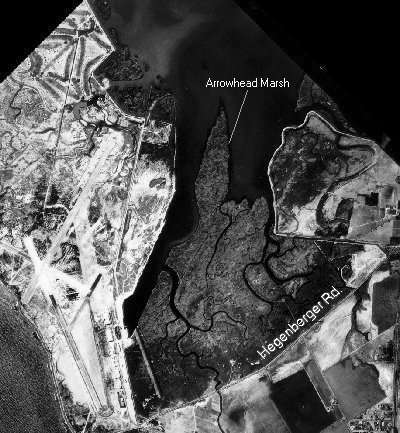 Today Arrowhead Marsh appears much as it did in this 1939 aerophoto. But the marshlands between Arrowhead Marsh and Hegenberger Road are buried beneath fill and industrial parks.